On this page, I am assembling photos, information and links to information all relating to Killynure, home to the OLIVER, JACKSON & BROWN family (plus others to be sure!). Sharon Oddie Brown. December 5, 2004. Updated March 31, 2010. Added 1714 Archbiships notes as well as St. Marks burials of COUSERs connected to Killynure. Updated June 30, 2016 Errors fixed, and details of GRIFFITHS added. See also: The Fight for Killynure. July 4, 2016 A post on my blog site all about Killynure - with photos. 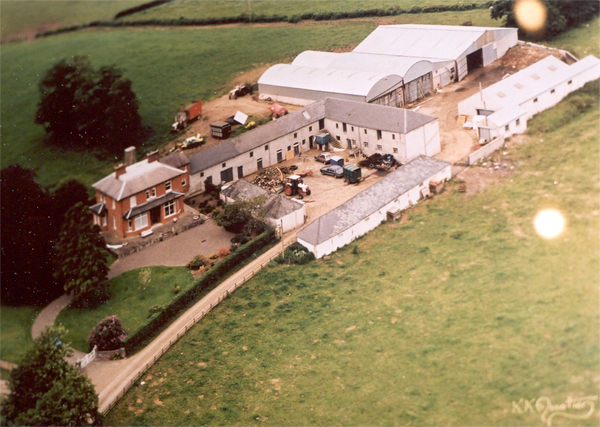 This is a contemporary aerial shot of Killynure House. The original red brick home is the home built by Thompson Brown and the outbuildings to the immediate east (right) predate it and may include the original bungalo home of the OLIVER family, now used for agricultural purposes or storage. The curved roof structures as well as the white outbuildings in front of them are modern. The brick house was finished by June 1883. 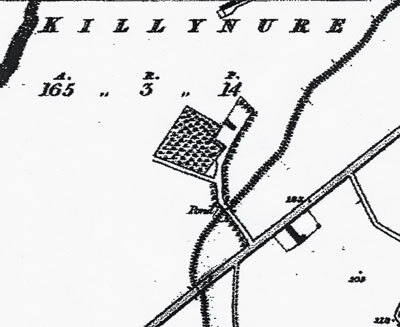 The map of the townland of Killynure is split between two maps: Ord 3:16 & 3:12. See PRONI VAL/2A/2/12A. 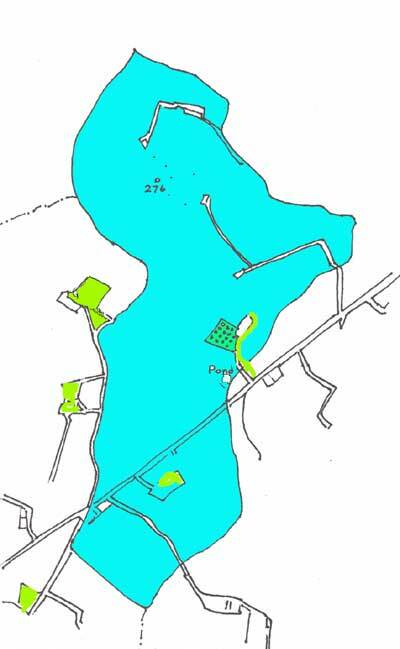 When I was last at PRONI, I couldn't read the details relating to the map as another reader had the file. 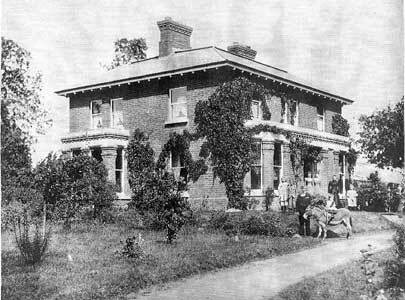 The redbrick house shown above was built by Thompson BROWN(E) in 1883 and is just above the main Monaghan-Armagh road. 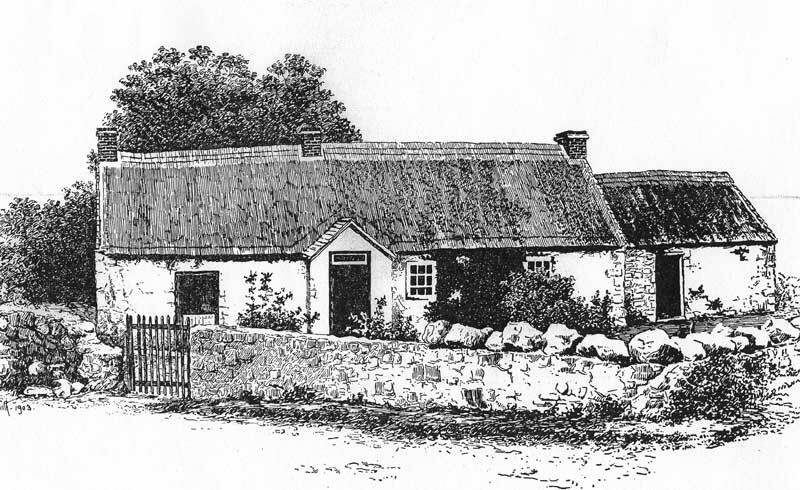 The house that preceeded it was a typical Irish bungalow, probably built with a thatched roof. The orchard shown to the west of the house was removed in the mid-1960's and is now planted in productive pasture. Edgar & Amanda KNOX, the current co-owners, remember the trees being very old and non-bearing. The property is still bordered by the old "March Hedge" - the name given to the hedge that the owner or his hired help would walk around as part of ensuring the safety of their property. 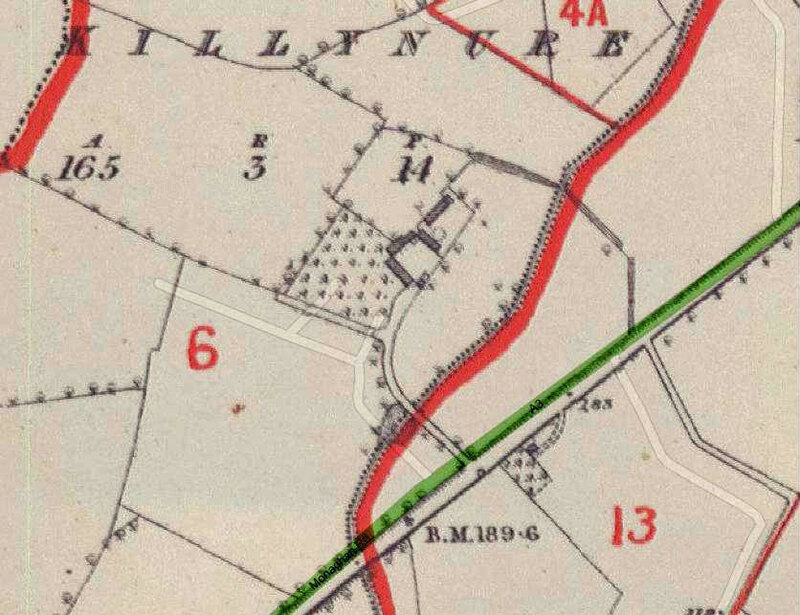 I was told that before 1835, the time of this map, the old Monaghan Road had run behind the house at the top of the property and past the home to the east that would have belonged to the MENARY family. I cannot corroborate this. I was also told that there was a hill called "School Hill" to the north of Killynure House. The oral history is that a school there had been started by the Jackson sisters (I know nothing more of this enticing bit although the number 276 is likely roughly where it was). Nanogh Hill was also North-East of the House. The fields which surrounded the house were called "Orchard Field" (where the orchard was) and the part that was east of the lane at the front of the house was called "Bush Field" with "Marlow Field" to the west of the lane. "Cousers Corner" is in the south-west corner. The soil that the KNOX family currently raise their cows and cattle on is exceedingly fertile. Edgar said that they get three times the yield of crops that an equivalent acreage would yield in most of England. They also graze their cows on nearby fields leased from other owners - just as the OLIVER family did years before them and likely some of the same fields in Enagh and other neighbouring townlands. Using of all these fields, they currently raise about 150 milking cows as well as 350 assorted cattle. It is a 365 day a year undertaking - a job with little mercy for those days when a back might ache, or a body feel the chills. In spite of the advantages of contemporary mechanization, it is likely that earlier genererations experienced much of the same ongoing labour and fears over the vagarities of the markets, weather and such. Still and all, to feel the soft muzzle of a new born calf, or to watch the sun pull the mist up from the early morning fields, it is a job and a place with its own particular glories. The house that Thompson BROWN built was certainly built to last. The pitch-pine used in the original window casement has never rotted. In fact, there isn't a bit of dry rot anywhere. I can attest to the fact that even to this day the stairs don't creak - a testament to a well built house. Over the years, some changes have been made. I am told that the lead roofing that can be seen on the earlier black and white photo was removed during WWI so it could be melted down for bullets. The room that was the maid's working area is now a small family den. Family memories of the house at Killynure include a toilet with a delft blue pattern and bell pulls for the maids in all of the bedrooms. The remnants of the bell pulls can still be seen. It is interesting to compare the two maps beneath. The one on the left was done at the time of Griffiths Valuation in 1864, which would have been before the brick structre above was built. The drawing shows three buildings arranged in a horseshoe, with another building to the east of that. About 30 years earlier, this map done in 1835 shows only two buildings, facing each other. It is curious, given the pattern of tree plantings which continue past the buildings. In the mid 1800s, the house to the west of Killynure would have been the home of William MENARY who married Mary JACKSON. I am told by a local neighbour, Eugene Fegan, that the original Oliver home was the more usual low bungalow style with a thatched roof. No pictures of this are known to me, but the home of Henry William OLIVER of Dungannon, Co. Tyrone is very similar. I am guessing that the white building to your left as you enter from the driveway may very well have been the original home. Family lore has it that one of the Oliver children died an untimely death as a result of drowning in the well which is behind the current house (covered by a substantial concrete slab!). In 1865 - and here my note-taking was a little shoddy as I was rushed beyond all reason - Thomas & William OLIVER were still the occupiers of KILLYNURE, the immediate Lessors were the Vicars Choral of ARMAGH (which meant that they leased the land from them) and the rateable annual income was £60.10.0. I am assuming that Thomas and William were the brothers of Elizabeth OLIVER as according to her marriage certificate, she was resident at Killynure at the time of her marriage in 1838. Thomas OLIVER is also mentioned as resident in Killinure in the March 31, 1865 probate of the will of Barbara DONALDSON. Theresa NICHOL née FEGAN and her brother Eugene FEGAN are decendants of the O'NEILs who lived at Killynure. She recalls that her great-grandfather or great-grandmother went to the school that either the OLIVERs or the BROWNs had on the hill at Killynure. Her Great Grandmother was Mary O’NEIL and her Great Aunt’s Rose & Anna O’NEIL. Consintine O’NEIL and his son Consintine O’NEIL also went to that school. There was a gatehouse at the entrance where Mr. MacIRATH lived. Mosey THOMPSON worked there as did John O’HAGEN and Charlie McCOY and Patty McSHANE. NOTE: I would take this to be Samuel MENARY of Killynure. In later years, the MENARYs lived in the townland to the west of Killynure, Magherkilcranny. I need to recheck this source for other names. KILLYNURE 1850 GRIFFITHS: Most were lessees from the Vicars Choral of Armagh Cathedral. Couser Joseph "Rep" I would think that they lived at the section to the south of the road to Monaghan, bounded by the road up to Aghavilly (see map above). 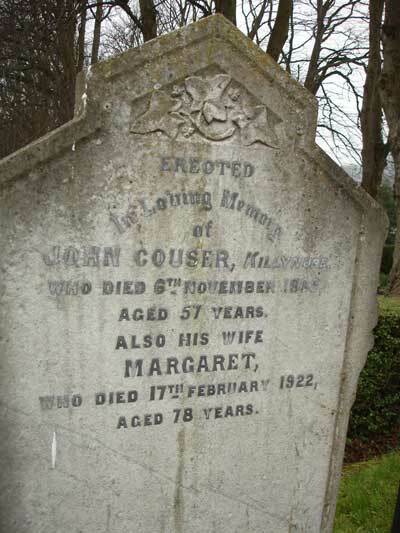 St. Mark's burial records for Killynure COUSERs include: Mary COUSER (1881-1935); William Benjamin COUSER (1876-1942) and Margaret COUSER (1878-1969). The bus stop there is called Couser's Corner. Couser Wm. Sr. He likely lived in the neighbouring townland of Aghavilly. Couser Wm. Jr. He likely lived in the neighbouring townland of Aghavilly. Donaghy Mary Mary & Sarah leased a garden sized plot with no buildings. Oliver Thomas Thomas OLIVER (abt 1812-1867) a son of Benjamin OLIVER. He and his brother held the largest and most valuable lease. O'Neil Arthur O’NEILs were also dressmakers. Their descendants include Theresa NICHOL née FEGAN and her brother Eugene FEGAN. Arthur O'NEIL held title to a small unoccupied building, and leased other land. The valuation of his leased land was the second most substantial holding in the townland. O'Neil Felix Felix O’NEIL was a strongman who went to America. He lived up on the hill, to the north east of the OLIVER house. Photographed in 2006 at St. Marks, Armagh. NARROW ESCAPE.--As William Maunsell, Esq., of Killinure House, was out with the harriers on Saturday last, near Athlone, he charged what he thought was a four foot wall, but at the other side was a deep pit. Owing to the goodness of his mare his life was saved, for she made an extraordinary spring, and reached the bank with her fore feet, so that he was able to throw himself on the bank; she fell back into the pit, from which she was extricated, but much injured. William OLIVER, of Killynure, Armagh, owned 55 acres. Arthur O'NEIL, address Killynure, Armagh owned 38 acres. Graham Henry 1833 AB Killinure Clogher An Anne GRAHAM married a William OLIVER on Dec 4, 1823. He probably married an OLIVER- or a DOBBIN! An Eliza KERNAHAN married a Benjamin OLIVER Jan 22, 1864. They had a daughter Annie in 1866. NOTE: Another source has the marriage at Ballybay, Co. Monaghan on April 1, 1863. Griffiths, Charles Huston Griffiths, William James of Dean's Bridge, Co. Armagh b.18 Oct 1879 Born at Killenure, Co. Armagh, 18th October 1879. NOTE: In 1901, Wm. A. GRIFFITHS was a boarder at House # 55 in Milford. His father was William James GRIFFITHS (b 1856), and his mother was Clair Kathleen HUSTON (b 1857). They were Church of Ireland, and in 1901 were living at House #3 in Mullynure, Grange, Co. Armagh with two daughter, Kathleen (age 22) & Edith (age 20), and a servant Bridget HUGHES. In 1911, Clair was still at Mullynure aka Mullinure, and was widowed, and living alone.